I’m just going to come right out and say it: I’m no stats buff. Actually, maybe that’s giving myself too much credit. I barely scraped through my compulsory statistics course. In my defense, the teaching was abysmal, and the class average was in the sewer the entire time. So, unfortunately, I don’t have the statistical chops that a real scientist should. But, today, I learned a new trick. Joorden’s and Pare gave me the idea while I was reviewing their paper for the Related Work section of my thesis. They used it in order to inspect mark agreement between their expert markers. In my last post on Grader agreement, I was looking at mark agreement at the equivalence level. Pearson’s Correlation Co-efficient should (I think) let me inspect mark agreement at the “shape” level. And by shape level, I mean this: if Grader 1 gives a high mark for a participant, then Grader 2 gives a high mark. If Grader 1 gives a low mark for the next participant, then Grader 2 gives a low mark. These high and low marks might not be equal, but the basic shape of the thing is there. And this page, with it’s useful table, tell me how I can tell if the correlation co-efficient that I find is significant. Awesome. At least, that’s my interpretation of Pearson’s Correlation Co-efficient. Maybe I’ve got it wrong. Please let me know if I do. Anyhow, it can’t hurt to look at some more tables. Let’s do that. Like my previous post on graders, I’ve organized my data into two tables – one for each assignment. Each table has a row for that assignments criteria. Each table has two columns – the first is strictly to list the assignment criteria. The second column gives the Pearson Correlation Co-efficient for each criterion. The correlation measurement is between the marks that my two Graders gave on that criterion across all 30 submissions for that assignment. Well, first off, remember that for each assignment, for each criterion, there were 30 submissions. Those 4 values on the right are the critical values that we want to pass for significance. Joorden’s and Pare ran their correlation statistics on assignments that were marked on a scale from 1 to 10. I can do the same type of analysis by simply running Pearson’s on the totals for each participant by each Grader. I already showed before that my two Graders rarely agreed mark for mark, and that one Grader tended to give higher marks than the other. The analysis with Pearson’s correlation co-efficient seems to suggest that, while there isn’t one-to-one agreement, there is certainly a significant correlation – with the majority of the criteria having a correlation with p < 0.01! The total marks also show a very strong, significant, positive correlation. Ok, so that’s the conclusion here: the Graders marks do not match, but show moderate to high positive correlation to a significant degree. Did I screw up somewhere? Am I making fallacious claims? Let me know – post a comment! This entry was posted in Research and tagged data, grader agreement, grading, marker agreement, marking, pearson's correlation co-efficient, r, significance, statistical significance, statistics on August 30, 2010 by Mike. Some More Results: Did the Graders Agree? 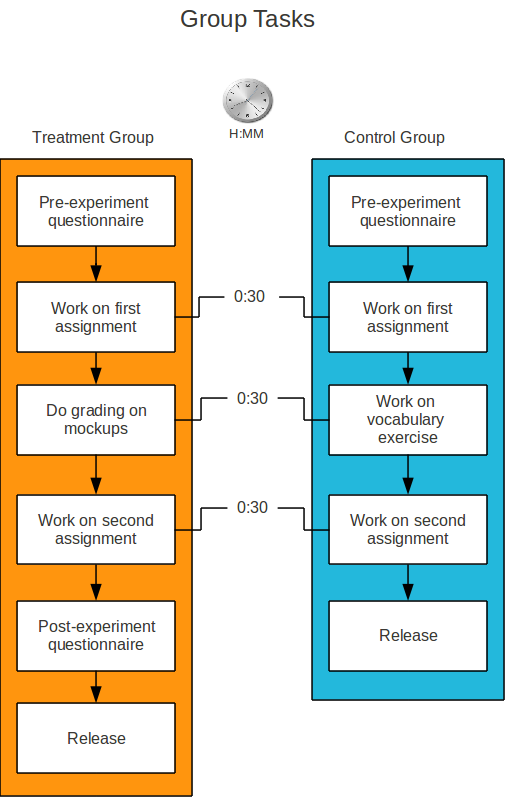 My experiment makes a little bit of an assumption – and it’s the same assumption most teachers probably make before they hand back work. We assume that the work has been graded correctly and objectively. The rubric that I provided to my graders was supposed to help sort out all of this objectivity business. It was supposed to boil down all of the subjectivity into a nice, discrete, quantitative value. But I’m a careful guy, and I like back-ups. That’s why I had 2 graders do my grading. Both graders worked in isolation on the same submissions, with the same rubric. So, did it work? How did the grades match up? Did my graders tend to agree? Sounds like it’s time for some data analysis! I’m about to show you two tables of data – one table for each assignment. The rows of the tables map to a single criterion on that assignments rubric. The columns are concerned with the graders marks for each criterion. The first columns, Grader 1 – Average and Grader 2 – Average, simply show the average mark given for each criteria for each grader. Number of Agreements shows the number of times the marks between both graders matched for that criterion. Similarly, Number of Disagreements shows how many times they didn’t match. Agreement Percentage just converts those two values into a single percentage for agreement. Average Disagreement Magnitude takes every instance where there was a disagreement, and averages the magnitude of the disagreement (a reminder: the magnitude here is the absolute value of the difference). Finally, I should point out that these tables can be sorted by clicking on the headers. This will probably make your interpretation of the data a bit easier. It only happened once, on the “add_passenger” correctness criterion of the Flights and Passengers assignments. If you sort the tables by “Number of Agreements” (or Number of Disagreements), you’ll see what I mean. Sort the tables by Number of Disagreements descending, and take a look down the left-hand side. Of those 14, 9 have to do with design or style. It’s also worth noting that Doctrings and the correctness of the __str__ methods are in there too. From the very beginning, when I contacted / hired my Graders, I was very hands-off. Each Grader was given the assignment specifications and rubrics ahead of time to look over, and then a single meeting to ask questions. After that, I just handed them manila envelopes filled with submissions for them to mark. Having spoken with some of the undergraduate instructors here in the department, I know that this isn’t usually how grading is done. Usually, the instructor will have a big grading meeting with their TAs. They’ll all work through a few submissions, and the TAs will be free to ask for a marking opinion from the instructor. By being hands-off, I didn’t give my Graders the same level of guidance that they may have been used to. I did, however, tell them that they were free to e-mail me or come up to me if they had any questions during their marking. The hands-off thing was a conscious choice by Greg and myself. We didn’t want me to bias the marking results, since I would know which submissions would be from the treatment group, and which ones would be from control. Anyhow, the results from above have driven me to conclude that if you just hand your graders the assignments and the rubrics, and say “go”, you run the risk of seeing dramatic differences in grading from each Grader. From a student’s perspective, this means that it’s possible to be marked by “the good Grader”, or “the bad Grader”. I’m not sure if a marking-meeting like I described would mitigate this difference in grading. I hypothesize that it would, but that’s an experiment for another day. If you sort the Decks and Cards table by Number of Disagreements, you’ll find that the criterion that my Graders disagreed most on was the correctness of the “deal” method. Out of 30 submissions, both Graders disagreed on that particular criterion 21 times (70%). It’s a little strange to see that criterion all the way at the top there. As I mentioned earlier, most of the disagreements tended to be concerning design and style. Well, let’s take a look at some examples. Grader 1 gave this method a 1 for correctness, where Grader 2 gave this method a 4. Barely meets assignment specifications. Severe problems throughout. I think I might have to go with Grader 2 on this one. Personally, I wouldn’t use a while-loop here – but that falls under the design criterion, and shouldn’t impact the correctness of the method. I’ve tried the code out. It works to spec. It deals from the top of the deck, just like it’s supposed to. Sure, there are some edge cases missed here (what is the Deck is empty? What if we’re asked to deal more than the number of cards left? What if we’re asked to deal a negative number of cards? etc)… but the method seems to deliver the basics. Not sure what Grader 1 saw here. Hmph. Grader 1 gave this method a 0 for correctness. Grader 2 gave it a 3. I see two major problems with this method. The first one is that it doesn’t print out the cards that are being dealt off: instead, it stores them in a list. Secondly, that list is just tossed out once the method exits, and nothing is returned. A “0” for correctness simply means Unimplemented, which isn’t exactly true: this method has been implemented, and has the right interface. But it doesn’t conform to the specification whatsoever. I would give this a 1. So, in this case, I’d side more (but not agree) with Grader 1.
print "Cannot deal more than " + num_cards_in_deck + " cards\n"
Grader 1 also gave this method a 1 for correctness, where Grader 2 gave a 4. The method is pretty awkward from a design perspective, but it seems to behave as it should – it deals the provided number of cards off of the top of the deck and prints them out. It also catches some edge-cases: num_to_deal is converted to an int, and we check to ensure that num_to_deal is less than or equal to the number of cards left in the deck. Again, I’ll have to side more with Grader 2 here. Grader 1 gave this a 1. Grader 2 gave this a 4. Well, right off the bat, there’s a major problem: this while-loop never exists. The while-loop is waiting for the value i to become greater than num_to_deal…but it never can, because i is defined as 0, and never incremented. I’d have to side with Grader 1 on this one. The only thing this method delivers in accordance with the spec is the right interface. That’s about it. My answer was “yes, they are, and that’s a correctness problem”. In my assignment specification, I was intentionally vague about the internal collection of the cards – I let the participant figure that all out. All that mattered was that the model made sense, and followed the rules. regardless of the internal organization. Anyhow, only Grader 2 asked for clarification on this, and I thought this might be the reason for all of the disagreement on the deal method. Looking at all of the disagreements on the deal methods, it looks like 7 out of the 20 can be accounted for because students were unintentionally dealing from the bottom of the deck, and only Grader 2 caught it. Subtracting the “dealing from the bottom” disagreements from the total leaves us with 13, which puts it more in line with some of the other correctness criteria. So I’d have to say that, yes, the “dealing from the bottom” problem is what made the Graders disagree so much on this criterion: only 1 Grader realized that it was a problem while they were marking. Again, I think this was symptomatic of my hands-off approach to this part of the experiment. My graders disagreed. A lot. And a good chunk of those disagreements were about style and design. Some of these disagreements might be attributable to my hands-off approach to the grading portion of the experiment. Some of them seem to be questionable calls from the Graders themselves. Part of my experiment was interested in determining how closely peer grades from students can approximate grades from TAs. Since my TAs have trouble agreeing amongst themselves, I’m not sure how that part of the analysis is going to play out. I hope the rest of my experiment is unaffected by their disagreement. Do my numbers make no sense? Have I contradicted myself? Have I missed something critical? Are there unanswered questions here that I might be able to answer? I’d love to know. Please comment! This entry was posted in Code Reviews, Research and tagged comparison, criteria, criterion, data analysis, disagreement, fairness in grading, graders, grading, marking, rubrics, tas, teaching assistants on August 24, 2010 by Mike.